Our clients can avail an extensive range of Voile Fabrics at industry leading prices. We have state-of-the-art facilities and employ the latest technological trends in order to attain maximum clients’ satisfaction. 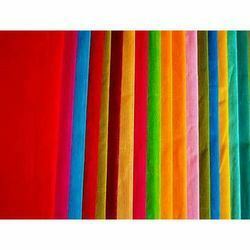 These fabrics are made of finest quality yarns, are semi-sheer and extremely breathable. The quality offered ranges from 52x38 to 92x104 and can be availed at industry leading prices. In order to fulfill the ever changing demands of our clients, we have been engaged in offering a quality range of Cotton Voile Fabrics. The offered range of cotton voile fabrics is available in different forms, specifications and patterns with respect to the diverse requirements of clients. Customers can avail these products at industry competitive prices. This range of cotton voile fabrics is admired in the market, owing to its attributes like fine texture, intricate design, long lasting fabrics, flawless finish and high tear resistant. Looking for Voile Fabrics ?